KNU decided to try something with the new batch of teachers that i came in with by assigning each of us to a local nazarene church. everybody was pretty unsure about it (and some still are), just because we are still most comfortable in a group, rather than venturing out individually. we were able to meet our pastors just once (as noted in a previous blog post) before they came to pick us up this morning for service. so alot of people had jittery nerves to start today out. fortunately, i have felt so comfortable with my pastor & congregation ever since i first met them on thursday. 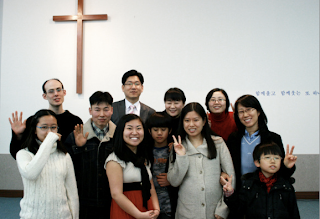 the pastor speaks and understands minimal english, and there are 2 attendees who speak english very fluently. they came and picked me up this morning and we had great conversation on the 20 min drive over to asan, a neighboring city. service started as soon as we arrived and i knew i was going to love it. koreans really know how to do hospitality here. they went out of their way to make sure i felt comfortable. they were sure to translate the order of service in the bulletin to english for my sole benefit. they had a hymnbook with both korean & english lyrics for me to use, and the pastor sang the last verse of every song in english...just for me! 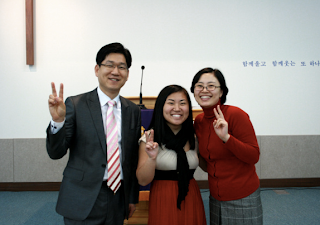 this was the most touching gesture because many koreans are shy to use the english they know, and that was definitely a way for the pastor to step out of his comfort zone to meet me in the middle. 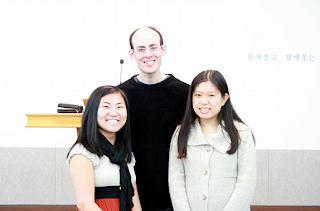 there was a part in the order of service titled "intercessory prayer," and hye won (one of the english speakers) leaned over to tell me that the pastor was praying just for me, as well as the whole rest of the congregation. it was overwhelming. everyone at the church was so kind! they also typed out a basic outline of the sermon so i would know what the pastor was preaching about. after the service, everyone came up to me and spoke basic english greetings - 'hi, nice to see you!' or 'nice to meet you!' again, this meant so much to me! then it was time to eat...bibimbap. they know the way to my heart! hahaha. it was so delicious. after we ate, we pushed all of the tables together for coffee & tea so we were sitting in a circle shape, and we had formal introductions. i was so impressed with their english! they told me their names and ages and other family members who were also in attendance. (it is not rude in korea to ask someone their age or other personal information. one of their first questions was - 'you have boyfriend?!' and they were so sad when i said i didn't. hahaha) then they wanted me to introduce myself. hye won is so fantastic and translated like a pro for me. the whole church was so interested in every aspect of my life and wanted to know all about me. i was so flattered by their genuine interest in getting to know me. after introductions, we took family pictures! hahaha. i loved it! alot of hilarious things happened in the course of conversation. first i tried to repeat a phrase they were teaching me which means "please give me a discount" when you are out shopping. and when i said it the whole church started cracking up. i had no idea what happened and they told me that i had said "give me a snack now." hahahaha. how appropriate, right?! i do love treats. then i tried to say another korean word and i totally screwed it up and they all just laughed. hahaha. they know i am trying hard to learn what i can, but they also understand that korean is very different from english and that it will take time. we also noticed that when the pastor translated the order of service into english for me, he wrote "apostles greed" instead of apostles creed. hahaha. everybody got a big kick out of that. i had so much fun with the whole congregation! before i could leave, they packed me up this big bag of stuff to bring home with me. a blanket, a coffee mug, and a calendar with bible verses in both korean & english, so i can practice. they told me that next week they will prepare a song in english for me. i was so flattered and am really looking forward to it! when we went to get in the church van to leave, everyone came out on the front step to wave at me as we drove by. i felt like i was leaving my family...i am really excited to get to spend a few hours with them again next week! most of the other teachers had decent experiences at their churches this morning, but i really felt so blessed to have such a great experience at mine. i came back and spoke so highly of it...i think one of my friends is actually going to come with me next week! hahaha. i can't wait for him to meet them and see how gracious they are to us. i am so glad to have a great church family here...it really makes all the difference!